Universal alkaline cleaner - concentrate. 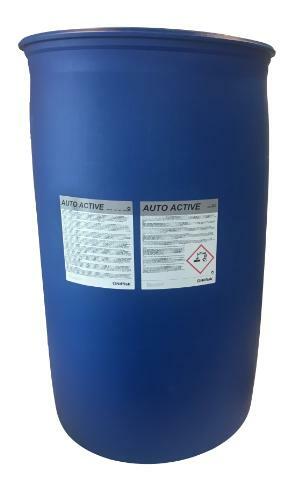 A liquid, foaming alkaline cleaner suitable for a wide range of cleaning applications for both the professional user, and the occasional user. Formulated to work effectively on any alkaline-resistant surface. Effective against: Grease, Oil, Soot, Protein, Mineral deposits, Road Film on vehicles. Car and Truck washing facilities, where it is suitable for cleaning the bodywork, as well as engine and chassis cleaning. Bus and Train maintenance facilities, where it is effective on external surfaces, as well as chassis and engines. Industrial and Manufacturing plants where it is used in equipment maintenance cleaning, as well as for some painting preparation processes. Economical to use because the concentrated formula does not lose its effectiveness whendiluted with water. Formulated with agents to inhibit the formation of calcium deposits. High degree of biodegradability, and formulated for easier removal from the water in recycling systems. Formulated for use on a very wide range of surfaces by users who are not experts. Universal application with minimal concern. Cleaning of cars, trucks, busses and commercial vehicles in self-service car washes or by high-pressure cleaner. Pre-spraying: Depending upon the type of soiling, pre-mix in concentrations between 1:10 (10%) and 1:50 (2%). Spray on the surface to be cleaned, and remove with high pressure washer before the detergent dries. Thick soiling may require more than one application. For engine cleaning, dilute 1:1 (50%) and apply to engine. Rinse with high pressure cleaner. Hand Cleaning: Use gloves to protect your skin, and dilute 1:20 (5%) to 1:100 (1%) and apply with brush or sponge. Do not use on HOT painted surfaces. Do not allow the detergent to dry on the cleaning surface!